The Museum of Pop Culture (MoPOP) announced today the opening of the most extensive exhibition celebrating the music of PEARL JAM. Organized by MoPOP in collaboration with PEARL JAM and Ten Club, the exhibit will feature more than 200 artifacts directly from PEARL JAM bandmembers and their Seattle warehouse. 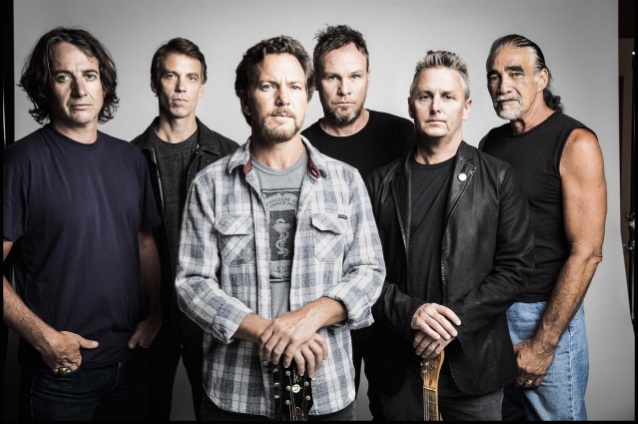 "Pearl Jam: Home & Away" (#PearlJamHomexAway) will coincide with the band's Seattle concerts dubbed the "Home Shows" and opens to the general public on August 11. "With the help of the talented crew at MoPOP, we're using the idea that we started with at PJ20 and taking the Pearl Jam Museum to a whole new level," says Kevin Shuss, PEARL JAM archivist and videographer. "Focusing on items from tours and memorabilia from the band's warehouse, the exhibit will be a must-see for any PEARL JAM fan." Spanning 28 years, the exhibition will feature personal instruments, equipment, stage props, original typewritten lyrics and notebooks, original poster and album art, set lists, and a photo op featuring the towering letters from the front of PEARL JAM's debut album, "Ten". "This exhibition will give an intimate first-hand look at PEARL JAM's journey from 1990 to the present and into the future," says Jacob McMurray, senior curator, MoPOP. "From their beginnings as one of the originators of the 'Seattle Sound' and the grunge phenomenon, to their sustained global impact as one of the most popular and respected bands in the world, PEARL JAM's story is still unfolding as they continue to sell out shows worldwide and use their stage to further social and political consciousness." "Pearl Jam: Home & Away" will be included with MoPOP general admission and will remain on view until early 2019.